July 14, 2011  Companies are lining up to help out Christian Lopez, the fan who graciously returned the historic baseball — and might have to pay a hefty tax bill because of the gifts he got in return. July 13, 2011  But whether Christian Lopez will be socked with about a $14,000 bill from the IRS is debatable. He gave back the ball Derek Jeter smacked for his 3,000th hit without expecting anything in return. 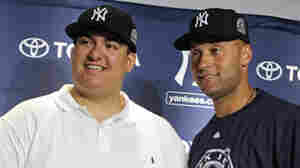 The Yankees gave him about $50,000 in gifts.